Please watch this video in full-screen. GT4T is a stand-alone program independent of any CATs or programs. It is accessed by hitting keyboard shortcuts. It does not add any buttons or interfaces to your CAT or office programs, so it won’t mess up things. It works everywhere you can type. In fact it works with this webpage too. To run this tutorial, make sure GT4T is downloaded (Click here to download) and running(GT4T icon appears on the right bottom corner of your screen). Set the source language as English. It’s important to finish this ‘Try-it-yourself’ tutorial to understand how GT4T help you translate. Ctrl+j (Cmd+J for Mac): Replace selection with MT translation. The optimum mix of computer power and human skills. Win+Ctrl+j (Cmd+Option+j for Mac): Display MT results from selected engines in a popup. Select and press this shortcut to display Google, Microsoft, DeepL, Yandex MT results to pick from. Without GT4T, it will be back to stone age again. 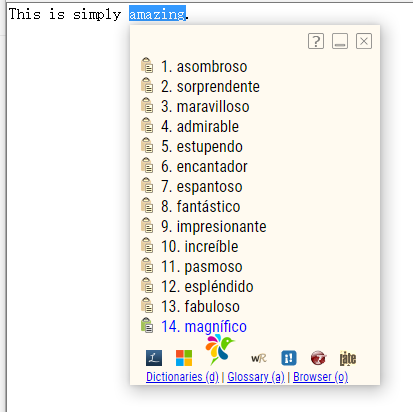 Select a word and press Ctrl+d to display a list of dictionary translations. Step one: Select a word or a phrase and press Ctrl+win+d. Press ‘a’ (or click on the popup) to open ‘add to Glossary’ screen and provide a translation. Step two: When you see the same word/phrase again, select it and press Ctrl+win+d (Not availale for Mac). The translation you provided at step one appears. For detailed instructions for Simple Glossary, click here. 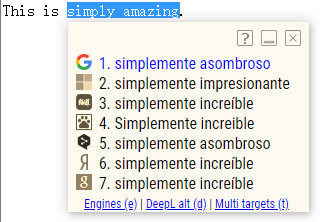 Win+Ctrl+Alt+J (Cmd+Ctrl+Option+j for Mac): translate current segment and show multi engine results. Now open a project in your CAT tool to try them! This is useful when clients ask to keep certain terms in the source language. Go to the setup screen (Ctrl+Alt+F2)(Command+Ctrl+F2 for Mac) ->Machine Translation and tick ‘Do not translate text between’ and provide an opening tag and a closing tag. Post-Translate: Terms in the Glossary will be marked as untranslatables and they are later replaced with the translations in Glossary after MT returns returns results. 1. Keep the source column and target column and delete all other columns. 2. Save the file as a ‘Unicode text’ file. 3. Go to setup->Dictionary and Glossary and click ‘Browse and set as current Glossary’ to set the saved file as Glossary. After setting the past translations as GT4T Glossary, you can then select a term in any application, press Win+Ctrl+d to search the past translations. HINT: Since GT4T Glossary file is a tab separated text file, you can also use copy/paste to add past translations to it. Open it with Excel to paste source in one column and target in another.